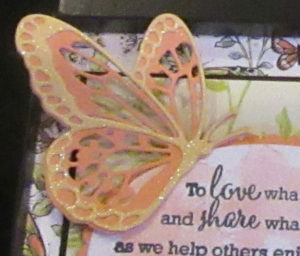 Today I am sharing a handmade Butterfly Frame that I recently made using the new Stampin’ Up! Butterfly Gala stamp set, the coordinating Butterfly Duet Punch and the Butterfly Beauty Thinlits. 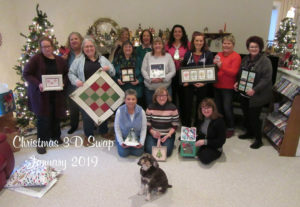 Each year my Stamping Team the New England StampINKers, has a 3D Yankee swap. Originally it started out as a Holiday party held in the beginning of December. But over the years we have moved it to the beginning of January since people are just too busy during the Holidays. The rule is that the items must be a 3D item made using Stampin’ Up! product. It does not have to be current product. We always have fun with these projects. This was the project that I made for this year. I have had this frame for a while and wasn’t sure what to do with it. Here are the details on the frame. I took the frame apart and removed the glass. I knew that I wanted the butterflies to be 3D so didn’t want the glass in the frame. Next I traced each of the openings onto the piece of paper that was in the frame. I used that as my guide to design each of the images. Next I selected sayings that I wanted to use. I wanted inspirational phrases and also wanted to use the Stampin’ Up! Statement of the Heart. the Stampin’ Up! Statement of the heart was a stamp that demonstrators could purchase last year. The “It’s a Beautiful Day” phrase is from the Share what you Love stamp set. The Share what you Love stamp set also has a background stamp that I used for the shading behind the Statement of the Heart with Calypso Coral ink. The 3rd phrase at the top right “Here’s to those that inspire us and don’t even know it!” is from one of the new Sale-a-bration sets Part of my Story which you can get for FREE with a $50 purchase of product! All the Designer paper used for this frame is also a Sale-a-bration item: The Botanical Butterfly Designer Series paper. You can see these and other Sale-a-bration items HERE. 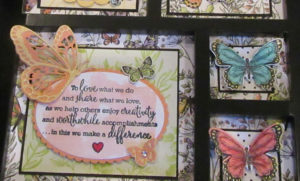 The two medium butterflies on the bottom right squares are punched out from the designer paper using the Butterfly Duet punch. I colored these butterflies with Blends markers. The small butterflies are also punched from the Botanical Butterfly Designer paper. Framelit Dies. 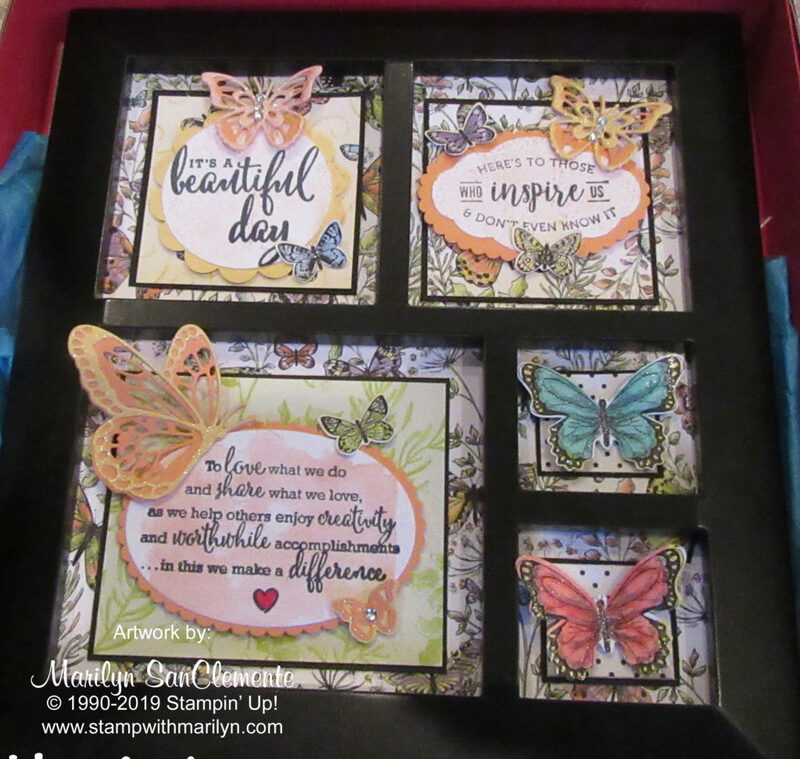 What I love about these dies is the detail of the butterflies and the layering that you can do with the dies. This is a “two-part” die. You cut a background layer and then a top detailed layer. 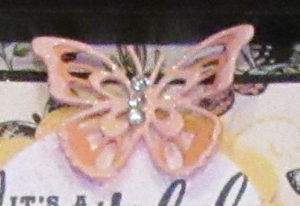 I used a little Wink of Stella to add some Glitter to the butterflies. I used the Fine Tip Glue pen to put these butterflies together. If I were doing this again, I would use the Multipurpose Adhesive sheets on the back of the cardstock so the layers are cut with adhesive. That would be easier to use than glue. Here is a picture of my team together with all of our 3D Items that we swapped. What a great time we had! Interested in joining my team? Sale-a-bration is a great time to join my team! During Sale-a-bration you receive and extra $50 worth of product for joining. And there is a second option to join and get a beautiful Crafting Bag. You can check out the details HERE. Feel Free to call me and ask questions. If you are in the USA I would love to have you as part of my team! Butterfly Beauty Thinlits, Butterfly Duet punch. Bookmark.